And that’s the last page of the Bugbear Talisman! I had a ton of fun making it, I hope you had a lot of fun reading it! 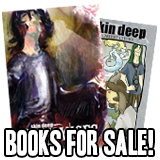 Skin Deep is going on a hiatus for October! I will be using this time to finish up what I need for the Orientations and Exchanges books (ISBNs, stickers, bookplates, proofreading, finalizing cover designs, buying packing supplies, etc). So in the meantime, I will be answering Reader Questions! I’ll take this week to collect questions, and then starting next week I will answer one a day until the comic comes back! How do you ask questions? You can leave a reply here, or down in the blog, or ask me on tumblr, if you follow me there, etc! Hmm, are there any completely underwater Avalons? And, while we’re on the subject, do they have any relation to atlantis? What sort of critters hail from the countries around India? Also the existence of the Garuda was confirmed by Madam U during Anthony’s second visit to Prestor John’s. Alec sure knows how to get even. Pffft. Hahahaha!!! XDDDD Bees everywhere! Oh man, almost forgot. O: What’s the quartet in Missouri studying at college (and/or what for)? Jim isn’t the first Finn to live with the Green Curse. Did his family know that the whole “freakishly tall with permanently long hair” thing was going to happen when he turned sixteen? But if you look at his youngest brother who has the blue curse, the tip of his tail is blue in colour, so there may have been a hint to the curse before he turned 16. Well, it seems pretty apparent even from an early age whether or not a member of the family will have a curse or not. The much younger Tim twins have white and red hair before they turned 16, and Colin, who isn’t even old enough to have a medallion yet, has a blue tail tuft. Best ending ever. I love you, Alec. Reader Question: I remember Michelle saying that she could read Merial’s magazine from on top of a cliff. Just how far is she able to see? Reader Question: So, Michelle’s story happens several months after Exchanges right? So what is Anthony up to? Is he living in the Avalon permanently now or has he gotten a medallion? I would also like to see a conclusion to Anthony’s story. I’m really hoping that his story arc wasn’t meant to be a permanent cliffhanger. I have a feeling that that’s going to be in the next chapter. to add on to that, I think this just might be the chapter in which the two parties finally meet. Plus, I thought it was agreed that this was a spell of transformation, not a medallion? I think there will be a few more a few more story arcs in America, if not specifically Missouri, before the Orientations gang heads for Liverpool. At least I’m expecting there to be a visit to Jim’s cousin Phin in New Mexico. Just my guess. Reader question: are there any bugbear crossbreeds out there? So what happens when the rest of the magical world finds out about Michelle? her being the last surviving sphinx and all. For some reason I imagine some “high society” busybody in the magical world taking it upon themselves to arrange the perfect marriage for Michelle. I don’t really think being stuck with some perfect person over saving her species would be much of a problem (considering how her father worked out fine with Janice Jocasta) rather than someone trying to arrange a marriage for Avalonesque-political-based reasons. If my memory serves me correctly, the way cross-species breeding works (except for very rare cases like Ike) is that the children will be fully one species or the other, not a mix of the two. So, for a completely random example, if a sphinx and a satyr were to have kids, they’d be either little sphinxes or little satyrs. Thus to ensure the continuation of the sphinxes Michelle just needs to keep having kids til one is born a sphinx. And thus was the concept of p*k*m*n invented. What is Michelle? A female eevee!? Ay-up! And just in case anyone hasn’t seen that spoof YouTube trailer of The Wicker Man (2006) recut as a comedy, which features that very line, here’s a *link*. I have only seen the original, with Christopher Lee who was by far and away the better actor. From what I heard, the remake was a mess and almost comedic, whereas the original was rather creep-i-fying and intense. Originals are almost always better. Jim, if you could have any superpower, what would you have? The Finns are one of the oldest gryphon families in England, does that count for all of Europe too or are there other old gryphon dynasties floating around? Do sphynx have extended lifespans like gryphons or do they only live as long as a human? What is the longest living race/species? Do any members of the magical world work incognito within the governments of the world so as to prevent the humans from finding out about the Avalons, magic, and the “monsters” that live beside them? She seems to think it’s worth it. 1. Do Nemian Lions have any other vunerabilities besides other Nemian Lions? 2. Are there any creatures who don’t require medalions to appear human? Bugganes (which Ike is a part of) can shapeshift in that manner… I think totems can as well, but I’m not sure if that was officially covered. Hmm. Think I saw a couple others, but I forget what else there was. Fantastic story, I love the sting at the end (pun intended). What’s Rhonda’s backstory? Why did she come to LA? Is she just visiting or settling down? Also, I’d love to see an impression of Jim’s first flying lesson (somehow I think Jim being hurled off a cliff by James would look rather funny). Anyone else reminded of Bioshock? I told her to check out the mead carefully, didn’t I?. Dean didn’t say anything about the extent to which Lily was rattled, so presumably he has seen her like this before, probably after previous pranking attempts. Wonder how long it will take them to clear the swarm from the Drunken Satyr? Oo! How about bumblebee mead tankards in the shop? I’d buy two! Reader Question! Are any of the Exchanges crew fashion designers for Avalon folks? Mi~ I wanted Something more… Macabre, but well… That sums it up. Reader question: How Alec’s Father Looks Like? I like my coffee like I like my women…COVERED IN BEES!! Like always, the best things in life are made of bees. What is a mythical creature that you have been wanting to draw but haven’t had the opportunity to yet? Also can we see Rhonda’s full form? I wonder if the mead-bee-jar is triggered by looking into it? On a similar note, are Nemeans unable to taste “sweet”, like normal cats? What does Dean look like human?! and fullform!? Reader Question! : Okay! I really want to know! Besides Martha, are there any other types of pets that Skin Deep characters can have? How’s Anthony doing these days? Haha! I laughed for so long seeing this. I’m glad I decided to check SD on my lunch break. Brilliant ending to a great story. My question would have to be: Are there any political/societal relations between the different factions of creatures? For instance, are the creatures of England on fairly good terms with American creatures? I guess I’m just curious of the creatures views of each other reflect human views of each other in terms of countries/culture. Can we see Bloodcarver in his human form? I am pretty sure western dragons don’t have medallions. Doesn’t mean that they can’t shapeshift. Otherwise, in a world with over 7 billion humans, “going on a vacation with my wife” might limit the number of places you can go. Not nearly enough people know that reference. Pity, too, because the very idea of Batman seriously lamenting the terrors of a “deadly bee weapon” is pure gold. Do Ifrits (aka Ifreets/Efreets/Afreets/Afrites/Afrits) exist? Can we see one? What about other kinds of Jinn? Medallions can be broken, as Satyr Greg knows. Some species have been deemed monsters and denied medallions, as Harpy Abbie explained. There are various looks to them. So who created medallions? If they exist and can be destroyed, that means they aren’t intemporal things that just always were there. They can have an end, they must have a beginning. And if it’s something along the lines of “you don’t get one ‘cuz we ain’t got nothin’ for the likes of ya”; it’s not a magical origin of the “one medallion just materializes along with a mythical creature”. They’re old artifacts that can be passed down generations; sure. But that’s not enough anyway. Take a large family with plenty of children, how do they get enough medallions for everybody? The absolute amount of mythical critters must increase just as much as the human population did. So creating medallions must be possible to at least some of the denizens of that world, even if not all. What prevents Tim from learning how to make one for his sweetheart? Why does he say there’s no ‘such thing as a “new” medallion’ despite some being newer than others? Some of this has been answered and I think what hasn’t will be plot relevant later. Basically, yes, someone made the medallions and made judgement calls about what species were to dangerous to have them. Who did it and how has been lost to history for centuries. When a family gets scarce of medallions, they most likely make a point for their children to be born human, though this could vary. There may be many Unturned bloodlines due to this. Whoever made the medallions made a lot of them, and enough creatures are happy to stay Unturned, or simply unaware that they are such, that the supply isn’t too strained. Any magic practitioner, whether sorcerer or being high in natural magic, who has attempted to work out how medallions work have found the magic in the medallions to be of such strength and complexity that trying to figure out how to repair one, let alone replicate the spell or make a new one from scratch for a monster, is a task on par with decoding Linear B. Perhaps not impossible, but the work of several lifetimes unless some sort to key is found. At present, medallions range from “old” to “really old” like any other antique or ancient artifact. umm how about…what would the child of a phoenix atavian and a bombay feline be? its just something me and my fiance were wondering, he’s the atavian while I am but a simple house cat. How did Alec get the bees in the mead? His magic or someone elses? He’s a bugbear. Making bugs appear where he wants them is one of the (magical) skills of his species. Is that how we get “bug” “bear”? Cause of the bugs and the fact that he is a bear? It’s from bugge bear, meaning “bogey(man) bear”. They’re bogles that take the shape of a bear to scare and possibly eat children who run away or stay out after dark (or sometimes go into forbidden areas, like with kappas and dangerous waters). Reader Question! What references do you use for the creatures? I.e., do you have a giant encyclopedia of fantastic beasts lying around? I sometimes leap from an an unfounded assumption to a foregone conclusion, but I have some speculations. First, an “idle” thought: the medallions were all made a long time ago, possibly before the Great War. Any comment? Once a mythical person has established a link with his or her medallion, they apparently don’t have to remain in constant contact with it. It’s just the simplest way to keep track of it. I’m guessing there’s a range limit for the medallion to be effective, or it would be pointless for the elders to revoke one. But, if that range is less than fifteen or twenty feet, somebody like Jim could have trouble getting through airport security. What is the range? I see that nokks and nixies, identified as being two genders of one species, have different medallions. 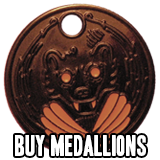 Do the different subspecies of gryphon require different medallions, also? Lastly, might the “long extinct” dragons have been one of the species capable of transformation, or illusionary concealment, without medallions? Are we going to be looking at the magical abilities of everyone more next arc? Reader Question! What is Michelle doing at College? In fact, what are all of the Missouri gang studying for? Are there any blue oxen in the United States, or perhaps other species and creatures from American tall tales and folklore that aren’t drawn from Native American myth? Does being a magical creature allow long life for some and others normal human spanned lives? If so, what creatures have longer life spans? Im not sure if the previous version i left showed up that i wrote, as i do not see it on the webpage, so ill write it again. Do certain magic creatures have longer life spans than normal humans? If so, please tell some of these species. Also, how long are some of the longer living magical creatures? How do Bugbears relate to the story of Goldilocks and the three bears? If Alec believes that Bugbears are involved in everything. 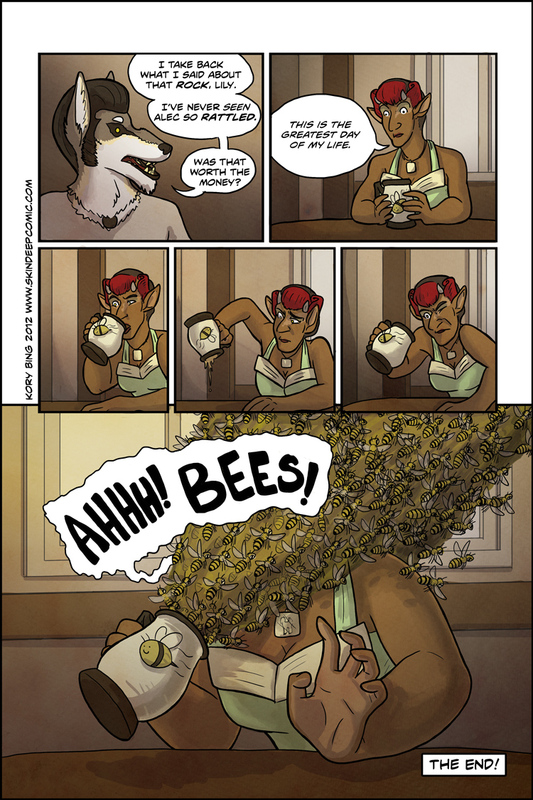 Also, how did Alec get all those bees into that little mug? That I will soon need a hearse. But to bug a bear requires lots of guts. Never stopping to let my prey pray. For all the deeds that were done to my back. Soon I’m gonna have one hell of a time. Never going to stop till the fun is through. I’m working on finding a good handheld voice recorder, preferably cheap in price. When I do I plan on emailing to Kory a recording of the tune that goes with the song. Can we please see some of the new characters for the new arc or if they aren’t new or you want to keep them a secret please could you draw something that would piss off Elise? Would anyone else have thought it funnier if there was a little bubble in the last panel of her friend “you don’t say”? @Rennis: Yes, it would have been a well-placed comedic tool. Reader Question: Are there going to be more fox species of Avalonians? I’m a fox nut, so I’m hoping for at least a Kitsune or two, but most cultures have a fox in their mythology. Can’t wait to see more! I would totally pay $15 for that last panel as a print, too. Just in case you ever decide to make money off your art. Heck, I’d pay $5 for a high-res version of AHHH! BEES!! !, mostly just for wallpaper. Also because I love it so much. Seriously, giggles. EVERY TIME. Just read through all of the comics in one go. dA Brought me here and this precious comic hooked me instantly (being myself a Mythical creatures lover plus Sphinxes and other feline like being my favorites) so I’ll throw a question.. Readers Question: I’ve seen that Michelle’s Father was an Egyptian Sphinx… Why does Michelle look more like a Greek Sphinx? All the female sphinxes are supposed to look like the greek ones and males would look like egyptian ones? does lily have a full long legged goat medallion? Just read through this comic in its entirety for the forth time or so… WHY CAN’T THIS BE REAL AND WHERE IS MY MEDALLION!?!?! so many NOT TEH BEEZ references floating in meh head!!!! augh! I like my women how I like my mead. Covered in bees! I think this is one of my most favorite arcs. I was pretty suspicious of the surprise mead in a cup with a bee decoration.